Chad Hustings blogged this past school year about building his own Hoffman apparatus for each group of students. I have been using a Hoffman apparatus that had been purchased by my district before I began teaching there over 20 years ago to demonstrate electrolysis of water, but providing each student group with the ability to perform an electrolysis themselves is a powerful activity. I have used a different version of a homemade Hoffman apparatus previously, but after reading Chad's blog post, I decided to use a version closer to his. To save time, I chose to use batteries rather than building power sources from old parts like he did. I encourage you to read Chad's post for an in depth explanation and extra references. The video and animation (from the Chemistry Comes Alive series available to ChemEd X subscribers) can be used before, during or after students have a chance to use their Hoffman apparatus. I generally use them during the discussion time after students have a chance to explain in their own words what has happened on a particulate level. I hope you will find the worksheet and teacher notes I am posting to be useful follow-up materials to his original post. If the Hoffman apparatus is built ahead of time (this takes about 5 minutes for each one if the teacher builds them), then the activity and discussion should take less than a 45 minute period. Refer to Chad Husting's previous blog post, Hoffman Apparatus on the Go and/or the references listed at the conclusion of the teacher notes that are available for download below. I found it easiest to build the apparatus before having students use them. This avoids having them use the scalpel/box cutter. It is surprisingly easy to push the thumbtacks into the bottle cap. I did try using plastic cups instead of bottles, but the sport drink caps are sturdy and can be reused many times while the cups won't hold up. If re-using, you will likely need to replace the thumbtacks. Remove the cap from an empty and clean plastic sports drink bottle. Using the top of the lid, line it up with a 9-volt battery to see where the two battery contacts will be centered. Place the lid top-side up and gently push two metal thumbtacks into the lid so that they will line up with the battery contacts. The thumbtacks should not touch. Using a box cutter or scalpel, cut the bottle in half. The top part will look like a funnel. Screw the lid back on the bottle. Set up the Hoffman apparatus as described below and observe. Step 1. Using clay or paper towel as a holder, place the 9-volt battery into the center of the bottom of the container. Step 2. Add about 50-100 mL of 0.1 M sodium sulfate (depending on size of the bottle) to the top portion of the apparatus. Step 3. Place the top portion of the apparatus into the bottom portion (using it as a holder) so that the thumbtacks line up with the battery contacts. Building a Hoffman apparatus for each group of students and setting out the other materials. I put this activity together and tried it with my own students after reading Chad's blog. I used the ACS Energy Foundations link as a resource. You may be interested in more of their material, especially their middle school curriculum that uses the Hoffman apparatus to teach about electrons and covalent bonding. Students who demonstrate understanding can design, build, and refine a device that works within given constraints to convert one form of energy into another form of energy. *More information about all DCI for HS-PS3 can be found at https://www.nextgenscience.org/topic-arrangement/hsenergy. Assessment for quantitative evaluations is limited to total output for a given input. Assessment is limited to devices constructed with materials provided to students. Emphasis is on both qualitative and quantitative evaluations of devices. Examples of devices could include Rube Goldberg devices, wind turbines, solar cells, solar ovens, and generators. Examples of constraints could include use of renewable energy forms and efficiency. How about this simple option? Have the student collect only one gas and calculate the other volume? To get a two to one volume ratio is very inconsistent and tedious. Guided Question # 1. Write the dissociation reaction for sodium sulfate. Is this salt an acidic salt, neutral salt or basic salt? 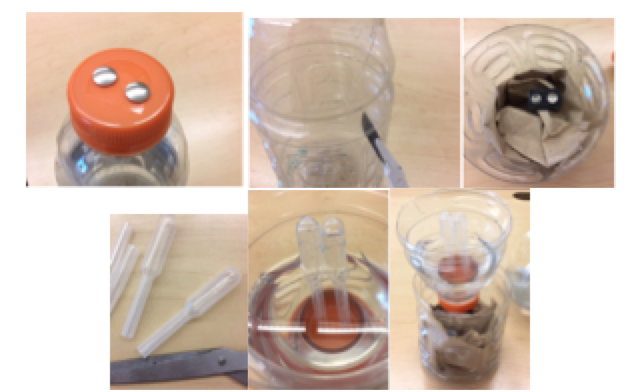 Immerse the gas collecting syringe into the beaker with the valve open or with no cap . Allow the liquid to enter the syringe barrel by immersing the syringe into thr centrifuge tube. Fill the syringe barrel to the top of the syringe up to the valve. Close the valve or cap so the liquid has no air pressure. Guided Question # 2 What is keeping the liquid up the barrel if the syringe bottom stays below the liquid level in the beaker? Place the Black alligator clip to the graphite lead which is inside the barrel to the negative lead on the battery. Place the red wire on the battery positive lead and to the graphite lead in the solution outside the barrel of syringe. Let the reaction run for 10 minutes. Adjust the vertical position of the syringe until the water level inside and outside the tube are the same. Record the volume of gas collected inside the barrel of syringe. Note the color change inside the barrel of syringe compared to the color outside the barrel. Guided Question # 3 Determine the reaction inside the barrel which is generating the gas. What gas is being produced? Justify your answer with the color change taking place inside the syringe barrel. Guided Question # 4 What is the number of moles of gas produced from the reaction inside the barrel and outside the barrel? Guided Question # 5 What is the reaction taking place near the electrode outside the barrel? Guided Question # 6 Which is the cathode and which is the anode? Guided Question# 7 What is the standard E for this system? Guided Question #8 Determine delta G for this system?